Drill Instructor Sergeant Leo Andavazo welcomes recruits of Delta Company, 1st Recruit Training Battalion, to Marine Corps Recruit Depot San Diego, California, January 5, 2015. Congratulations! You're on a new journey toward becoming a Marine Parent. The pride you will feel is indescribable, but the whirlwind of emotions and persistent questions may be overwhelming. We provide the answers. From the moment your son or daughter decides to enlist in the Marine Corps, you begin a journey into what is often times an unfamiliar place. You'll likely have dozens of questions and will want to connect with other parents who understand the pride, uncertainties, and emotions you're feeling. RecruitParents.com, a project of MarineParents.com, Inc., was developed to help guide you through the journey toward becoming a Marine parent. 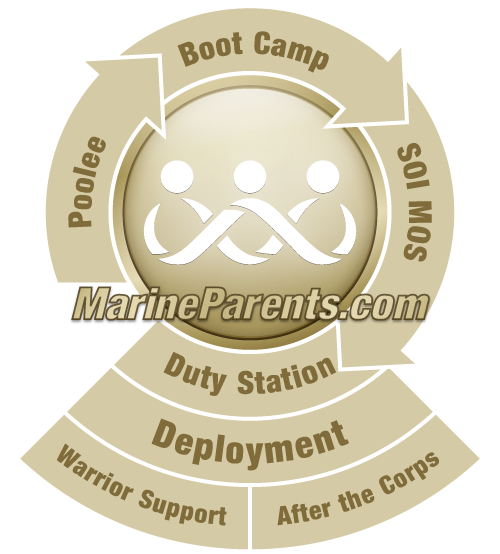 The RecruitParents.com roadmap includes information about recruit training (Boot Camp), schedules, terminology, expectations, and, perhaps most importantly, provides opportunities to talk with other parents—novices just like you, as well as "expert" parents who've been down this road and know firsthand what you're going through. Your son or daughter must earn the title of United States Marine. Recruit training is a strict training program that builds Marines with the core values of the Marine Corps—honor, courage, and commitment. Our EGA Shop offers Marine Corps wear, memorabilia, graduation t-shirts, and graduation announcements. All proceeds support MarineParents.com, Inc. services.